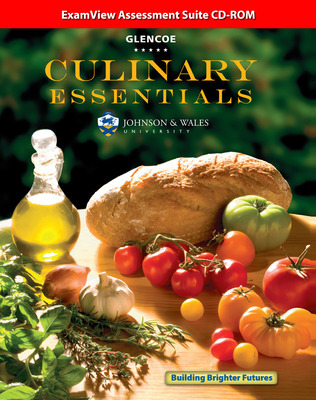 A new hands-on approach includes unit-length Culinary Projects and chapter-based Certification Prep activities, Culinary Lab applications, and step-by-step illustrations. This is the perfect tool to get students ready for Skills USA competitive events and prepare for advanced culinary studies! A new hands-on approach includes unit-length Culinary Projects and chapter-based Certification Prep activities, Culinary Lab applications, and step-by-step illustrations. This is the perfect tool to get ready for Skills USA competitive events and prepare for advanced culinary studies! Latest in HACCP (Hazard Analysis Critical Control Points) safe temperature controls are included. Glencoe's trademark academic integration includes standards cited at point of use, reading strategies, study tools, writing practice, and extensive vocabulary development. Helps teachers meet Perkins mandates. Nutrition Notes zero in on key facts students need to know.